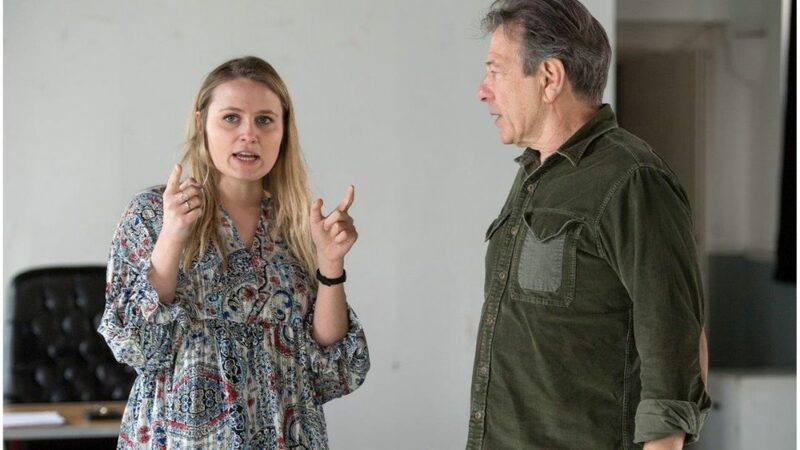 Katharine Farmer directs a timely revival of Jerry Sterner’s darkly comic Off-Broadway hit, Other People’s Money at Southwark Playhouse. Written in 1989, Other People’s Money is a funny, fast-paced and provocative comment on the greed and excess of the 1980s. It will star Michael Brandon as Jorgy, Lin Blakely as Bea, Amy Burke as Kate, Rob as Larry and Mark Rose as Coles. Other People’s Money is at Southwark Playhouse 17th April – 11th May 2019. You’re directing Other People’s Money at Southwark Playhouse, what can you tell us about it? A play about corporate raid may not instantly come to mind as a great night at the theatre, but Jerry Sterner’s 1989 play that exploded Off-Broadway and eventually found its way to the West End in the early 1990s is painfully relevant in Brexit Britain and a surprisingly entertaining fable about greed. ‘Other People’s Money’ is a two hour, two act play that doesn’t shy away from the tension between old values and the new. Behind all the doughnuts is a message about instant gratification and a jam-today approach to money. In a world increasingly about self-gain, ‘OPM’ fights for maintaining morality in the modern world. Audiences may remember the film adaptation, how different is the stage version? There’s no Hollywood ending, no sugar coating but rather a candid portrayal of real people trying to make a buck. Unlike the film, the play is much more of a clash of titans – the proud CEO who’s kept his father’s company alive despite economic downturn and the investment banker whose self-worth is wrapped up in his net-worth. But it’s also about relationships and family values and that’s really how it stands apart from the film. The film was almost a romantic comedy as it focused on the sexual tension between the investment banker (reimagined as Garfield for the actor Danny DeVito) and the female lawyer Kate as they struggle for power, whereas the play is more about their intellectual sparring. The characters are more self-serving in the stage play and as a result has a stronger message about the greed is good culture that permeates modern thinking. What have you found most challenging about bringing Jerry Sterner’s script to life? ‘OPM’ is unapologetically about the finance industry, which is an area I’ve had to familiarize myself with to direct the play. Although audiences don’t need any prior knowledge to enjoy the show, I knew that I had to understand the terminology and belief behind corporate raid to fully get a handle on the script and why these characters behave the way they do. What was extremely useful to us in rehearsal was having a leading industry professional come and speak to us about why he worked as an investment banker and share with us the brighter side of a dark business. Understanding his passion for economic growth was essential for us creating a playground where there is no villain. It first opened 30 years ago, how have you found it relates to modern day? Feminism has changed a lot in the past 30 years and that’s been a great subject to tackle in the rehearsal room. Addressing themes of sexuality and female empowerment is certainly different today than it was when the play was written, but Sterner clearly has something to say about the misogyny that was rife in Wall St in the 80s/90s and handles the issue liberally. What’s been fun with working on a play that is very much of its time but still has relevance to today’s socio-economic climate and the struggle for equality in the workplace. What have you enjoyed most about working with the cast? This cast have been a joy to work with. Their boundless energy and enthusiasm is infectious and has meant that rehearsal is focused but fun. By far the best thing about working with this group of actors is their ensemble spirit and understanding that nothing in the play is redundant. Sterner is an excellent writer and every scene reveals something important. The actors have been great at harnessing this and supporting each other during the discovery period. What would you say to anyone thinking of coming to see Other People’s Money? The play is an honest reflection of the changing world and as a result it’s a brutal, poignant and often quite funny. Audiences should come prepared to be active spectators in the show and listen to each character’s story and try to sympathise. Sterner’s play offers insight into each character and their motive which is what makes it so human and relatable. It’s a comedy, but I hope audiences will recognize the dilemma in the play is equally applicable to the here and now.